Quality and Effectiveness: This set of more than 60 color-coded modules includes a large variety of “bits,” including wheels, a wireless transmitter and receiver, a fan, light sensor, buzzer, switches, motors, wires, and more fun stuff. 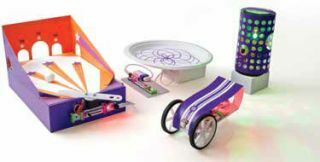 With Gizmos and Gadgets, building and inventing new contraptions is easy, fun, and teaches kids to be creative and learn about circuits. Young makers will build science, technology, art, and math skills as they play, program, remix, and test and share their imaginative designs. Ease of Use: It’s super simple to use—all kids have to do is connect the bits, which connect magnetically. The enclosed pamphlet explains how to use the different pieces properly, in a very easy-to-use format. The step-by-step instructions cover 12 basic projects. Creative Use of Technology: Kids can easily create simple circuits or more complex ones in minutes. Once they get the hang of it and master the basics, they can break out of the box to create all sorts of new projects. LittleBit’s community pages and the free LittleBits app provide more inspiration and ideas for thousands of other projects. Suitability for Use in a School Environment: Gizmos and Gadgets can be smoothly integrated into an existing curriculum or school environment because it’s fun, imaginative, and teaches kids about technology. The kit includes all the basic elements necessary to start a mini makerspace right in the classroom. We really enjoyed this product. I (Peter Andrew, age14) made a remote control car, which was really awesome because I built it. I had to figure how to fit it on the board, how to wire it together, etc. This is something I’m definitely putting on my wish list. I (Ana Sophia, age 10) would give this five out of five stars. I built a mini concert using the Little Bits, which got lots of compliments. This would be great for schools. ● Teaches kids about technology.